This pack contains a wide array of generic items. 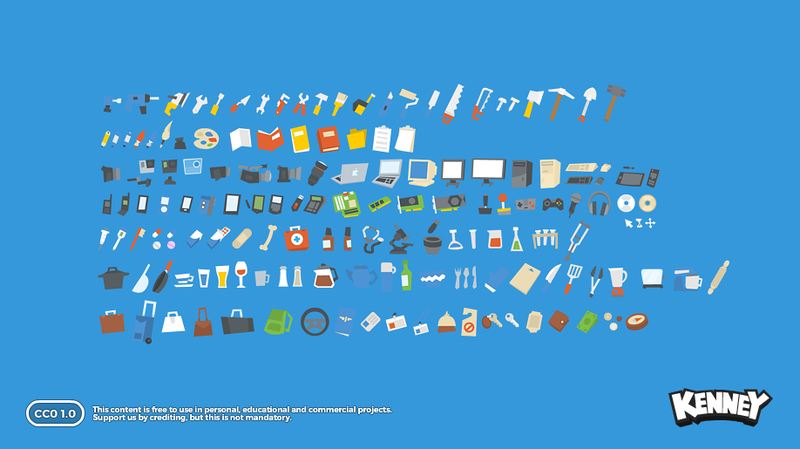 Tools, medical, tech, travel, transport and more. Just from my own item image sets (and its new unrelased version) other than weapons and armours. * Misc: Map, Pocket Watch, Alarm Clock (digital and analog + bells), Magnifying Glass, Praying Beads, Gymnastic Ribbon, Cane/Walking sticks, Hand Fan. * Other valuables: Vase, Urn (like to store ashes), gold watch, teddy bear, geodes and if not already in another set different gems, ingots and metal nuggets, ring, pendants, gold/silver chains, crowns . Dont you responce any quesions asked from your site? I do, although I get a lot of e-mails a day so it might take a while before I answer. Curious as to why you've set them up the way you have in the vector sprite sheet. It makes it tricky to copy/paste them to new inkscape projects, for one. @Kenney: would you be willing to modify the first aid kit? A red cross on a white background is a trademark strictly inforced by the Red Cross. Until then I have to mark this as having a licensing issue.